APRIL 2014 UPDATE -- During April we prayed concerning . . .
* ELECTIONS IN INDIA AND INDONESIA (RLPB 254). UPDATE: Voting continues in India until mid May. Meanwhile, Indonesia's Election Commission reports that it may not be ready to announce results on 9 May as scheduled. However, voting trends indicate that the next Indonesian government will be much like the previous government, i.e. restricted by coalition politics and compromises. Secular nationalist parties won 68 percent of the vote while Islamic parties won 32 percent (up from 29 percent in 2009) and parties with an overtly Islamist position are coming in last. Pray that Islamists will be marginalised as they ought to be and not empowered through quid pro quo deals. where officials in Zhejiang province have moved to 'rectify' the problem of too many large churches and crosses corrupting the skyline. 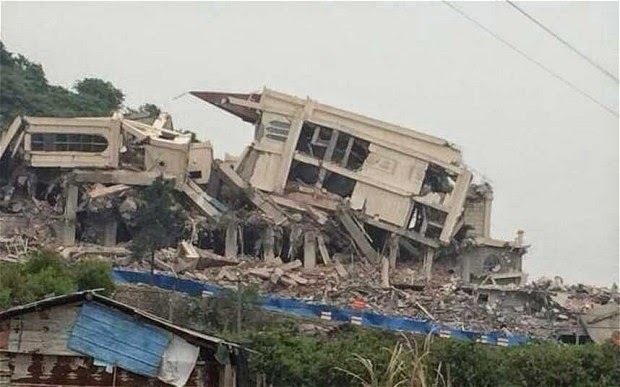 Since early April the struggle has centred on the Sanjiang Church in Wenzhou, where some 3000 local Christians rallied together to save the church that had been threatened with demolition because leaders refused to remove the cross. After a long stand-off, the local Communist authority and the church negotiated a deal whereby the church agreed that two levels of a newly built, seven-storey annex could be removed. However, the government removed four floors, not two, angering church members. Nevertheless, the main church building and its prominent cross was to remain untouched. Then on Monday 28 April, armed Special Task Force officers blocked the roads leading to the church so that heavy equipment could move in and demolition of the main sanctuary begin. According to local sources, at least six leaders were arrested -- five from the Sanjiang Church and one from the nearby Tengqiao Church. While local authorities are defending the demolition, local Christian leaders have expressed outrage. Chen Yilu, the head of the Government-approved Nanjing Union Theological Seminary, slammed the provincial government for its 'crude and hard-line' handling of the Sanjiang Church crisis. He said the incident would damage the Communist Party's image and risk 'social stability'. Religion expert Fenggang Yang warned of an escalating struggle between the rapidly growing Chinese Church and the ruling Communist Party which is determined to rein it in. According to reports, orders have been issued for cross removals and partial demolitions ('rectifications') at 10 (and possibly more) churches in the area. * BORNO, NIGERIA (RLPB 257), where Boko Haram had abducted more than 200 teenage girls from a secondary school in the Christian enclave of Chibok. The mass abduction of schoolgirls has rocked the nation and triggered widespread outrage. According to reports, most of the abducted schoolgirls have already been married to third parties abroad -- mostly other Boko Haram militants in Cameroon and Chad. Dowry payments of 2,000 Nigerian Naira (US$12.50) per 'bride' were paid to the abductors. The Chibok community is traumatised and frustrated by government inaction. Locals who witnessed girls being taken towards Cameroon tried in vain to alert the local senator before going directly to the local army barracks where they were told to put their concerns in writing. Of course this gave the militants time to escape across the border. Women from across Nigeria will stage a 'One Million Women' march in Abuja on Wednesday 30 April, under the banner 'Free Our Girls'. The women are also calling for prayer and fasting that God might 'touch the hearts of the insurgents to release the girls'. At this point, the use of force is simply too dangerous. Muslims and Christians are coming together for the children of Nigeria. * SYRIA (also RLPB 257), where the Battle for Aleppo has entered a new phase as jihadists and rebels intensify efforts in the north-west, seizing Kessab (RLPB 253) and surging deeper into Aleppo, where the Syrian Arab Army (SAA) is pushing back. On Sunday 27 April Aleppo was shaken by several massive explosions. Jihadist seeking to advance into government-held areas had tunnelled into the heart of the Old City and detonated explosives underneath the Chamber of Industry, where government forces have their headquarters. Dozens were killed and wounded. After the bombing, heavy clashes ensued between jihadists and the SAA. Rebels have increased their shelling of government-held areas too, causing many casualties. Pray for Christians trapped in Aleppo. APRIL 2014 ROUND-UP -- also this month . . .
On Saturday 26 April Muslim rebels attacked a medical clinic run by Doctors Without Borders (MSF) in Nanga Boguilla in north-west CAR, killing at least 16 people, including three MSF staff. While some rebels looted the clinic, others stormed the open area where MSF staff and community members had gathered for a meeting and opened fire with automatic weapons. Seleka leader Mohamed Moussa Dhaffane denied that the killers were Seleka, asserting that Muslim rebels from Cameroon were operating in the area. The central region of Bossangoa is still wracked with insecurity. 'There is a situation of total chaos in my diocese,' says Mgr Nestor Désiré Nongo-Aziagbia, Bishop of Bossangoa. He was seized by Seleka rebels on Easter eve, a day after one of his priests was killed on Good Friday. 'The rebels continue to kill and plunder,' he says. 'Last weekend in a village on the border with Chad, four people were killed, among them two catechists.' Mgr Nongo-Aziagbia says jihadists have infiltrated Bangui (the capital). 'It is public knowledge,' he says, 'that the Central Mosque of the city has become a powder keg, because the extremists have transformed it into their arsenal.' Instead of fulfilling their mandate -- disarming fighters and protecting the vulnerable -- French and African peace-keepers are escorting Muslims to the north, where CAR authorities fear they will eventually establish a Seleka-run state within the state. According to Mohabat News, human rights news sources in Iran have reported that on 18 April plain-clothed security officers raided the private apartment of Nazi and Maryam Asadi, breaking up a Good Friday worship service taking place there. The Asadi's, Ehsan Sadeghi, Vahid Safi and Amin Mazloomi were all arrested and taken into custody. The security personnel also searched the home and smashed the satellite dishes on the roof of the apartment block. Late on Monday 28 April Boko Haram militants attacked Gubla village in Madagali Local Government Area in Adamawa State, killing four residents. More than ten homes were torched, as was an EYN (Brethren) Church, including the pastor's official quarters. Many more villagers would have been killed had they not fled so quickly into the bush. The Movement for Solidarity and Peace (MSP) in Pakistan has released a report entitled 'Forced Marriages & Forced Conversions in the Christian Community of Pakistan' (published April 2014). According to this report around 1000 minority girls -- some 300 Hindus and 700 Christians -- are forced to marry Muslim men in Pakistan every year. Furthermore, the MSP acknowledged that this is just the tip of the iceberg, as most cases either go unreported or fail to progress. This is human trafficking across religious lines. Such large scale systematic abuse could not endure without the tacit consent and overt co-operation of Islamic clerics, law enforcement officers and government officials. This shameful reality leaves Christian girls in a state of permanent insecurity. On 15 April one child died and 61 people -- children, parents and teachers -- were injured when a rebel rocket hit an Armenian Catholic School in Damascus. This was not the first time rebels have targeted a school full of children. On 11 November 2013 rebels fired mortar rockets at the Armenian Christian Tarkmanchats High School in Damascus just as the children were leaving for the day. Their school bus was hit and four first-graders and the bus driver were killed. (Updating RLPB 250, 4 March 2014.) Every day, mothers of Raqqa's growing number of 'disappeared' gather outside the ISIS headquarters (formerly the Armenian Church) weeping and begging for information. Sema Nassar, a prominent human rights activist, says ISIS is believed to be holding 'over 1000 Syrians in Raqqa province', adding that those suspected of opposing ISIS or violating Sharia Law simply vanish without a trace or are publicly executed. A group of courageous dissidents has launched a campaign called 'Raqqa is Being Slaughtered Silently' and is using Facebook and Twitter to share photos and raise awareness of abuses. One photo dated 26 March is of a young Christian man who had been accused (without evidence or witnesses) of killing a Muslim. The Christian was executed and left tied to a cross in a public square for three days for all to see. A set of crucifixion photos dated 29 April show four young men all crucified in a public place. Please pray for God to intervene in Syria. -- 187 teenage girls still missing from Chibok, Borno. On 25 February 2014 Boko Haram militants slaughtered at least 59 teenage boys boarding at the Federal Government College in Buni Yadi, Yobe State, Nigeria. After rounding up the female students, the militants sent them off with orders to abandon their education and get married [See RLPB 249 Feb Update]. According to Morning Star News, in a subsequent video released on March 23, Boko Haram leader Abubakar Shekau threatened to kidnap schoolgirls. Escalating violence across Borno had already forced the temporary closure of the state's 85 secondary schools. At 11pm on Sunday 13 April, Boko Haram militants invaded the Christian enclave of Chibok in the south of Borno State. After looting and burning shops and homes, the militants attacked the local Government Girls Secondary School where some 300 girls aged between 16 and 18 were sleeping, having come to sit for a physics exam. The attack, which lasted until 4am Monday, culminated in the abduction of around 270 girls, some of whom managed to escape as they were being sped away in open trucks. The Rev Titus Pona, chairman of Borno State Chapter of the Christian Association of Nigeria (CAN) told Morning Star News most of the kidnapped girls were members of the Church of the Brethren in Nigeria (EYN). Christians in Borno are at a loss to explain how such violence and terrorism can continue with impunity in a state under emergency rule. When Borno governor Kashim Shettima later visited Chibok, parents presented him with a list of 234 names of missing girls. 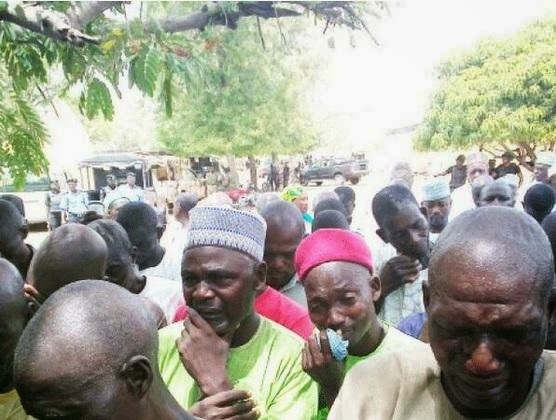 Distressed and frustrated from lack of action, parents and volunteers formed a search party on Maundy Thursday (17 April) and set off on some 1500 motorcycles to storm Sambisa forest where it is believed Boko Haram is hiding and where it is presumed the girls are being held captive. Deep in the forest they found makeshift camps and met people who claimed to have seen their daughters. Eventually they came across a man who confirmed that the base camp was near, but warned them that the militants were heavily armed and would not hesitate to kill. Without military back-up, there was nothing the parents and volunteers could do. Returning to Chibok empty-handed, they appealed to Governor Shettima to deploy security forces and rescue the girls. On Easter Sunday (20 April) the Christian Association of Nigeria (CAN), Borno state chapter, announced three days of prayer and fasting for the immediate release of the abducted schoolgirls. On Tuesday 22 April, parents confirmed that more than 40 girls had escaped and 187 were still missing. Grave concerns are held for the girls' welfare as they are doubtless being used as human shields and possibly also as wives or slave-girls/possessions with whom sexual relations are lawful according to Islam [Qur'an Sura 23:1-7]. Please pray! * protect and sustain the captive girls spiritually, emotionally and physically, and give special grace to those who know him so they will encourage, care for and witness to the girls who do not. May God be glorified! * open the way for the girls to be liberated and reunited with their families. May God be glorified! * call to account Boko Haram's wicked, arrogant leader Abubakar Shekau [see Psalm 10]; may Boko Haram become leaderless and the militants be beset with confusion. * cause Nigeria's Muslim masses to reject violence and intolerance, and may the wisdom and beauty of the Gospel of Jesus Christ be evident to all. May Christ build his Church and may God be glorified! With the Syrian Arab Army (SAA) ascendant in the south, the rebels are escalating their attacks in the north -- seizing Kessab (see RLPB 253) and escalating the Battle for Aleppo. Christians in Aleppo are again facing siege conditions as rebels advance, cutting supplies to government-held areas and leaving Christians without food, water and electricity. By Maundy Thursday (17 April) one Christian pastor in Aleppo was expressing his fear that the Battle for Aleppo would result in the Christian quarter being overrun by Islamists. This pastor was so concerned for people's safety that he chose not to advertise Easter services. However, on Good Friday some 100 people braved the rockets and mortars to come to his church telling the pastor, 'We would rather die worshipping in our church than sitting in our homes.' A local doctor told World Magazine reporter Mindy Belz that the endless bombing and rocket fire has felt 'like an earthquake'. Dozens have been killed. By Easter Sunday the SAA had reportedly regained control of al-Ramouseh road, restoring some supplies. The fighting continues and the trauma is profound, as is the danger. Pray that the Lord of Hosts will protect and provide for his faithful people in Aleppo. May God bring peace to Syria. ALSO: At the behest of Saudi Arabia (the world's leading sponsor of international terrorism) the US is now supplying sophisticated armour-piercing weapons to the 'good' and 'moderate' rebels, despite the fact that the Free Syrian Army openly aligns with the al-Qaeda linked al-Nusrah Front and routinely stages joint operations with their 'brothers in Islam', including against Christian communities. The US is so committed to regime change in Damascus that it seems not to care about costs or consequences. Pray that God will thwart every wicked scheme that threatens his precious children. Easter was a time of great distress for the parents of 187 teenage girls kidnapped by Boko Haram militants from the Christian enclave of Chibok, in Nigeria's Borno State. On 17 April parents and volunteers on some 1500 motorcycles found the militants deep in the Sambisa forest but without military backing there was nothing they could do. Weeks have passed since the mass abduction and the girls still have not been rescued. Pray that God will liberate these girls. Meanwhile, in Syria, the Battle for Aleppo has intensified. The Syrian Army is fighting rebels who are attempting to invade Christian areas. Shaken by rockets and bombs, traumatised and besieged Christians have been without food, water and medical supplies for weeks. Please pray for the Church in Aleppo. To fallen humanity, the Cross represents a truly dangerous idea, a dangerous choice. For some the Cross represents a threat to their personal sovereignty, sexual freedom and status in the world. For those in hostile environments the Cross represents a threat to their family, liberty and even life. Across the world, including Kosovo, Egypt, Raqqa (Syria) and Zhejiang (China), crosses have been pulled down and smashed, sending a loud message to the Church and the local population that 'Christianity is not welcome here'. The Cross will always be a symbol of persecution at the hands of a hostile world that wants to be rid of Christ. But for those who understand and believe, the Cross will always be wondrous, a symbol of divine love, hope and life in all its fullness. for your amazing love, which led you to the Cross for us. for your perfection, which meant death could not hold you and now cannot hold any who are 'in Christ'. MAY WE never be ashamed of the Cross of Christ our Saviour. MAY WE never be ashamed of those who are persecuted because of the Cross of Christ. LORD GIVE US boldness and faith to exalt your Cross at all times so that peoples and nations might see, hear, understand and believe. The Cross of Christ is the most obvious and enduring of all Christian symbols. Satan cannot abide the Cross for it symbolises his defeat. Fallen humanity hates the Cross because it threatens personal autonomy, sexual freedom, power and all that fallen humanity holds dear. In many parts of the world today the Cross is under attack and Christians are suffering persecution because of the Cross of Christ. In Kosovo, Egypt, Raqqa (Syria), Wenzhou (China) and beyond, crosses have been pulled down and smashed to send a loud message to the Church and the local population that 'Christianity is not welcome here'. But for Christians, the Cross will remain a symbol of all we believe and hold dear. The spiritual battle continues -- please pray for the persecuted Church this Easter. With a population of some 10 million, Wenzhou, in China's eastern Zhejiang Province, is one of China's great coastal megacities. A 480km drive south of Shanghai on the East China Sea, Wenzhou is often referred to as 'China's Jerusalem' as it is believed to have the largest Christian population of any city in China -- possibly as high as 30 percent. Wenzhou is a business hub known for its many successful Christian entrepreneurs who actively promote Christianity in their workplaces. Whilst the Christian entrepreneurs do strive to maintain good relations with local authorities, that they hold considerable economic power in Wenzhou is doubtless one reason why the churches seem able to be quite active. According to China expert, Dr Kurt Selles, Wenzhou has some 1800 churches which operate openly despite most not being registered with the government. 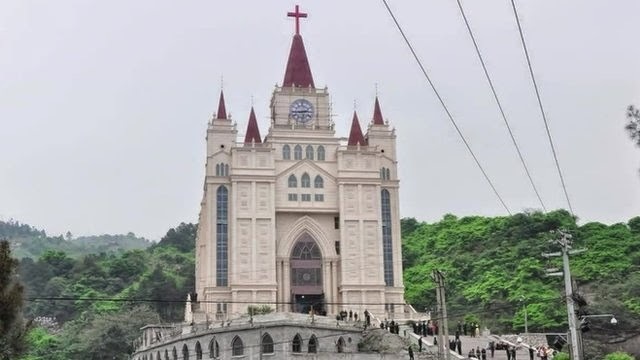 For more than a decade, the success of Wenzhou's Christianity-infused businesses has aroused government interest in the link between Protestant Christianity and successful capitalism. [See below for related articles.] This demonstrable link has created a dilemma for the Chinese Communist Party (CCP) which is keen to exploit any business model that generates wealth, yet believes it must rein in and control Christianity lest it undermine Communist Party authority. On 8 January 2014 Zhejiang's Communist Party secretary, Xia Baolong, was conducting an inspection in Zhoushan (north-east Zhejiang) and was shocked by the proliferation of large churches. While passing a church in Baiquan town, Xia reportedly objected that the cross atop the church was 'too conspicuous', and demanded that the local Religious Affairs Bureau 'rectify' the problem by removing it. The CCP might want to reap the benefits of Christianity, but it certainly does not want the Church to grow! And so began a campaign to de-Christianise the landscapes and skylines of Zhejiang. 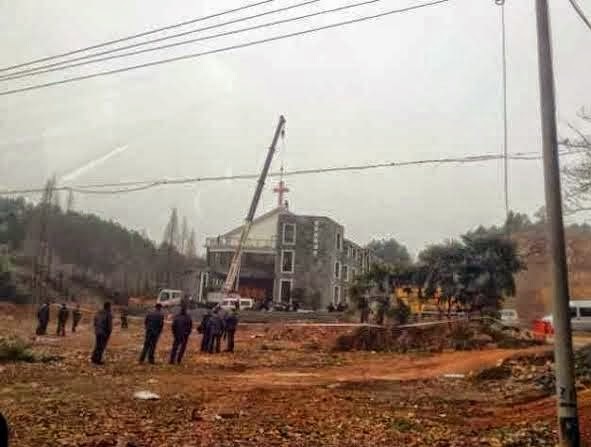 On 27 February officials from the Zhoushan Religious Affairs Bureau demanded that believers at the government sanctioned church in Baiquan, Zhoushan, help tear down the cross on top of their building. The Christians refused and a stand-off ensued. At eight storeys tall and covering 1000 square metres, Sanjiang church in Wenzhou's Ou Bei township is large by any standards. The building includes spaces for worship, teaching and accommodating the elderly. The church is registered with the authorities and is part of the government-controlled Three Self Patriotic Movement (TSPM). The members, along with many relatives working overseas, raised the US$4.8 million for the construction. Everything was approved by the Wenzhou municipal government, which designated the church a 'model project' in September 2013. When the Christians refused to remove the cross and several spires from the rooftop, the authorities responded by threatening to demolish the entire building, falsely accusing the church of adding illegal structures in violation of building codes that rendered it structurally unsound. Meanwhile, demolition notices were reportedly also sent to churches in Taishun, Wencheng and Ruian townships. A church in Yongjia County also is understood to have been ordered to remove its cross and the top floor of the church. On 25 March members of Sanjiang church commenced a protest and on 3 April the pastors were notified that the church would be demolished within 15 days: i.e. by 18 April (Good Friday). Since then some 5000 local Christians have been participating in round-the-clock prayer vigils and sit-ins, praying that the church might be saved from demolition. He Hongying (81) said she would stay in the church day and night for as long as necessary. 'We feel at peace,' she said, 'and fearless when we are with our God'. The struggle for Sanjiang church has come to represent the struggle between Chinese Christians who are unashamed of the transformative power of the Gospel, and abusive CCP officials who love money and despise the Cross. * use the crisis at the Sanjiang church to open the eyes and ears of multitudes of Chinese, locally, nationally and inside the CCP; may they believe what the Church has been showing -- that Christianity is good not only for business, but for families and all of society, because Jesus cleanses from sin, the Holy Spirit enables righteousness, and God's wisdom is truth! * raise up voices for justice across Wenzhou and throughout Zhejiang, so that CCP officials will be forced to relent and stop abusing their power to attack the churches. * protect and bless all those believers who are risking their security and liberty to stand for their right to lift up the Cross of Christ as the hope of the nation; may the Lord hear their prayers and bring revival to Zhejiang. Wenzhou, in China's eastern Zhejiang Province, is a coastal megacity of some 10 million residents. Known as 'China's Jerusalem', it is home to as many as three million Christians. They include many Christian entrepreneurs. Objecting to the 'conspicuous' nature of large crosses atop many large churches, Zhejiang's Communist Party secretary recently demanded that authorities 'rectify' the situation by removing the crosses. 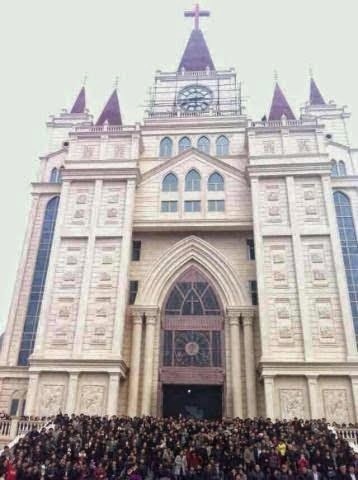 The campaign to de-Christianise landscapes and skylines across Zhejiang is coming to a head in Wenzhou where a major stand-off is under way at the eight-storey, 1000 square metre Sanjiang church. When the church refused to remove its cross and spires, authorities ordered the church's demolition. Some 5000 local Christians are participating in prayer vigils and sit-ins, day and night, to prevent demolition. Please join them in prayer. Groundbreaking article by Chinese economist Zhao Xiao, published in 2002. Market Economies With Churches and Market Economies Without Churches. -- plus: Pakistan update from Joseph Colony, Lahore. Voting for India's 16th Lok Sabha (House of the People, parliament) will be held in nine phases between 7 April and 12 May. The Bharatiya Janata Party (BJP) -- the political wing of the Hindutva forces (collectively known as the Sangh Parivar) -- is poised for a landslide win. While the BJP lost the 2004 and 2009 Lok Sabha elections, it was not because Hindutva was in decline. Favoured to win in 2004, the BJP's narrow loss -- only evident in the last phase of voting -- was a complete surprise. Then in April-May 2009, the BJP lost narrowly yet again despite being expected to win. Clearly their belligerent rhetoric after the November 2008 Mumbai terror attack frightened many voters. Meanwhile, the Sangh Parivar's unchallenged activism has ensured Hindutva's advance, despite the BJP's losses. Sadly, the inept and corrupt Congress-led UPA government has failed to arrest or even address the spread of Hindutva, wasting two terms in office (ten years) as violent persecution of Christians has escalated and spread nationwide. The BJP's candidate for Prime Minister is Gujarat Chief Minister and Hindutva hardliner, Narendra Modi. One of India's most divisive and sectarian figures, Modi was Chief Minister (CM) of Gujarat in February 2002 when Hindutva forces incited a Hindu pogrom that left as many as 2000 Muslims dead. Modi was also Gujarat's CM in February 2006 when Hindutva forces propagated the slogan 'Hindu Jago, Christio Bhagao' (Arise Hindus, throw out the Christians) and set the stage for a pogrom against Christians in Dangs. Calling upon Hindus to kill Christians just as the Hindu god Ram killed the demon Ravana, the Hindutva ideologues aimed to deal a 'death blow' to Christian missionary activity in Dangs (see RLM Jan & Feb 2006). Praise God he answered the prayers of many and the deadly plot of the Hindutva protagonists failed. To hide his rabid sectarianism and to woo minorities, Modi is running on an anti-corruption, pro-economic development platform (see RLM, 2 Oct 2013). Enormously popular, Modi could well be India's new Prime Minister by mid-May. Should the BJP win power, it will doubtless move to have anti-conversion legislation at the federal level, with freedom of religion redefined along Hindu nationalist lines so that anti-conversion laws can be fully enacted in accordance with a re-written or re-interpreted constitution. India's population includes over 70 million Christians (5.8 percent) or possibly as many as 100 million (9 percent) according to Operation World. Furthermore, India is the world's second largest missionary-sending nation, with some 83,000 Indian missionaries working cross-culturally, mostly in India. The Indian Church stands to be impacted profoundly by these elections. Whilst the majority of Indonesians are tolerant and enjoy Indonesian pluralism and traditional cultures, fundamentalist Islam is spreading through the nation, just as it is globally. Although President Susilo Bambang Yudhoyono (SBY) could be described as a 'moderate' -- i.e., a nominal Muslim who enjoys traditional Javanese culture -- he has been willing to broker quid pro quo deals with Arabised Islamists whenever he has needed their endorsement or vote. Consequently, though SBY has impressed international mainstream media and foreign diplomats with his liberal tolerant rhetoric, radical intolerant Islam has advanced not simply under his watch, but with his complicity. Under the present government, numerous Sharia-inspired laws have been passed and belligerent Islamists have been permitted to defy the Supreme Court and persecute Christians with impunity. [See report from CSW and interview with Ben Rogers.] Voting for the next parliament will take place on 9 April, followed by a presidential election in July. * awaken Indians to the threat and ugliness of Hindutva; may the BJP not win the majority it seeks. * awaken Indonesians to the threat of Islamist influence; may the winning party or coalition have a convincing victory, so that Islamists will be marginalised and Islamisation wound back. * influence the Indonesian elections to produce a result that will help rather than harm the gravely threatened predominantly Christian Melanesians of Papua. On 9 March 2013 -- a little over a year ago -- as many as 7000 local Muslims attacked a Christian enclave in Lahore known as Joseph Colony after a local Muslim accused a Christian of blasphemy. The police advised the Christians to flee and then stood back as the rampaging Muslims looted and burnt some 160 homes, 18 businesses and two churches. (RLPB 201, 12 Mar 2013). To this day, none of the attackers has been convicted of looting or arson. However, on 27 March 2014, Sawan Masih (26) was convicted of blasphemy and sentenced to death despite the total absence of any material evidence. The ruling will be appealed in the Lahore High Court. Please pray that wickedness and injustice will be exposed and condemned. Voting for India's next Lok Sabha (parliament) will be held in nine phases between 7 April and 12 May. The Bharatiya Janata Party (BJP) -- the political wing of the Hindutva forces collectively known as the Sangh Parivar -- is poised for a landslide victory. If elected, the rabidly sectarian, vehemently anti-missionary, militant Hindu nationalism of the BJP will impact profoundly the nation's over 70 million Indian Christians and 83,000 Indian missionaries. Pray that the BJP will not secure a majority. Meanwhile, Indonesians will vote for their next parliament on 9 April, with a presidential election in July. Pray that Islamists will be marginalised so that they can no longer influence policy. Please pray the result will help and not harm the persecuted and gravely threatened Melanesian Christians of Papua.